Scroll down for a fantastic review! Happy October! Time for Halloween costumes, trick-or-treating, vampires, ghouls, goblins and . . . The Box Under The Bed! 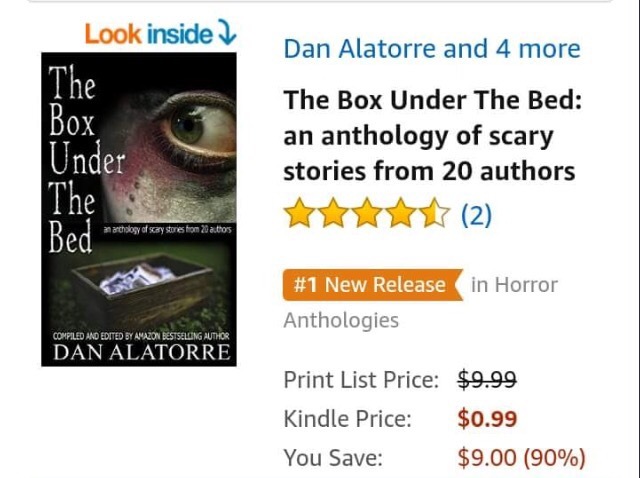 Guest blog post by a co-author ofThe Box Under The Bed,Anne Marie Andrus. Hi, I’m Anne Marie and I want to thank Dan for helping me become a published writer! During this past year, two of my stories have won second place in Dan’s Word Weaver Writing Contest. The October 11th release of my own novel has been planned for a while, and Chapter 2 of that novel is The Crescent from the April Word Weaver Contest. Talk about a confidence boost when I really needed one! Word Weaver was the first writing contest I’ve entered, so winning a prize was a “pinch-me” moment! Even better than winning (or almost), was Dan’s great critique style. He caught things that nobody had ever commented on before. This is not a normal, concise and word-perfect post from me. It’s a ramble because I need to say it, to heal, and to keep being me. The past few months have been devastating for so many around the world—acts of terror, terrifying weather and just the unstoppable march of time. It’s hard to believe that in 2017, I could be surprised at how hateful and cruel people can be to each other. Yet…I’m shocked. My confession: I am not political. My truth: I am human. In the face of absolute disaster and human suffering, do not tear others down. Be kind to strangers, even if they are not kind to you. You have no idea what people are going through. If you can’t or won’t take any of these actions, shut up. Please. Then, Monday, October 2nd, 2017. One of those days I wonder, why bother? We’re irreparably broken. I stumbled across an old post I never published—I probably should have. It was from another time that I questioned writing and reading fantasy, when everything was wrong with the world. I felt frivolous, silly…like a waste of time…or a big lie. It took some time to work my way free. I didn’t post this yesterday. I couldn’t hit the button. Today, Tuesday October 3rd, 2017…people are standing in lines for hours to donate blood. The singers, painters, jewelry designers, authors, photographers and songwriters—without your genius, every ounce of joy and beauty will be lost forever. You are our only true hope.